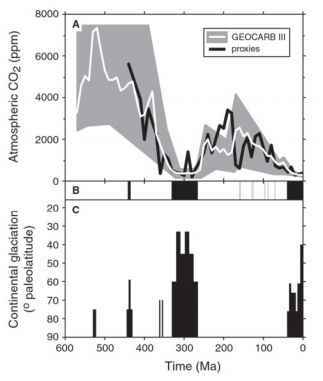 It should be apparent from the discussion in this chapter that there are many unanswered questions regarding the rate of CO2 degassing over geologic time, including the Phanerozoic. First, there is a need for better data on present degassing rates, especially on the relative contributions of metamorphism and diagenesis to global degassing. Second, there is the problem of how degassing rate has changed over geologic time. If seafloor creation (spreading) rate is an important consideration, then there is a need for better data on this subject. If spreading is not a good degassing indicator, then other paleo-degassing methods are needed. One possibility is the abundance of volcanic rocks, a topic addressed in this chapter by means of a new calculation of relative degassing based on Russian data on volcanic rock abundance. Even if done correctly, however, volcanic rock abundance only accounts for volcanic degassing, and not that due to metamorphism and diagenesis. Third, degassing accompanying regional metamorphism in compressional mountain belts needs further study. Fourth, hot-spot and md-plate volcanism needs better integration into carbon cycle models. Finally, changes over time in the carbonate content of down-going oceanic slabs during subduction need to be better quantified. This leads to such questions as, were there abundant pelagic carbonates during the Paleozoic? Of all the major aspects of the Phanerozoic carbon cycle, the input process of global CO2 degassing is the least well understood. It is unlikely that methane has served as a principal greenhouse gas over long periods during the Phanerozoic. However, on the scale of less than a million years, the release of methane from the breakdown of methane hydrates may have caused dramatic excursions in temperature driven by excessive CO2 formed by the rapid atmospheric oxidation of the released methane. Large short-term negative carbon isotopic excursions are best explained by this process.